Flexeril is a drug designed to treat certain conditions of the muscular system, with the most common issue it treats being muscle spasms. The correct Flexeril dosage will depend on the age and health of the patient. However, there is a standard Flexeril dose. This is one cyclobenzaprine 5 mg tablet taken three times a day. What time of day is best to take cyclobenzaprine and how much is safe? Let’s take a look. How Shall One Take Flexeril? What Is the Standard Flexeril Adult Dosage for Muscle Spasms? What Is the Standard Geriatric Dosage for Muscle Spasms? What Is the Standard Pediatric Dosage for Muscle Spasms? What Are the Renal and Liver Cyclobenzaprine Dose Adjustments? What Shall One Do If Missed a Dose of Cyclobenzaprine? What Is the Recreational Dose of Cyclobenzaprine? What Is the LD50 of Cyclobenzaprine? 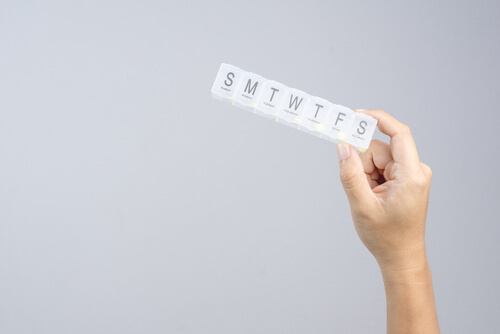 When taking a cyclobenzaprine dose, there are no restrictions on the time of day it should be taken. However, it is important that the cyclobenzaprine dosage is scheduled at least eight hours after the previous one (assuming the patient is taking the immediate release formula and not the extended release formula), though doctors may indicate that the patient should go longer between doses. There is no requirement that Flexeril doses be taken after eating. Still, some patients prefer to do so, especially when they are prescribed higher doses of the drug (i.e., cyclobenzaprine 20mg tablets). Having to take a medication every eight hours can be difficult for patients, as it often means waking up early or going to bed late in order to get in all three daily doses. However, this is the only safe option. A schedule that works for many is to take the first dose at six in the morning, the second at two in the afternoon, and the last at 10 in the evening. Those taking extended release formulations of the medication will need to time their Flexeril dosage differently. Healthy adult patients being treated for muscle spasms generally begin with one Flexeril 5mg pill being taken every eight hours. If this cyclobenzaprine dose does not elicit the desired response, the doctor may choose to up the dose to one Flexeril 10mg taken every eight hours. In rare cases where the muscle spasms are severe and resistant to treatment, the doctor may opt to increase to one Flexeril 20mg pill every eight hours. Note: If using an extended-release formula, the starting dose is 15 mg once a day, increasing to 30 mg once a day if needed. No matter the cyclobenzaprine dose prescribed, treatment with the drug should last no longer than three weeks. Continuing treatment for longer than three weeks greatly increases the risk of cyclobenzaprine side effects developing. Determining the correct cyclobenzaprine dosage for geriatric patients is more complicated than doing so for adult patients. The first thing that must be considered is cyclobenzaprine interactions, as elderly patients tend to take multiple medications at once. There is a strong chance that elderly patients will be deemed ineligible for treatment with Flexeril because they take a vital medication that negatively interacts with it. The Flexeril max dosage for geriatric patients is lower than with healthy adult patients. It is one cyclobenzaprine 5mg pill taken every eight hours. In many cases, doctors will suggest it only be taken every 12 hours. Extended-release formulas are contraindicated for elderly patients. Pediatric dosing of Flexeril is similar to that for healthy adults. However, it should be noted that it is not recommended for pediatric patients under the age of 15. Dosing starts at one cyclobenzaprine 5 mg pill every eight hours. Increasing the dosage to one cyclobenzaprine 10 mg pill every eight hours is considered in severe cases. Treatment with Flexeril should last no longer than three weeks. Extended-release formulas have not been tested on pediatric patients, and thus their use is not recommended. For those with kidney problems, no dosing adjustment is needed when taking Flexeril. This is because the medication is processed by the liver, not the kidneys. However, this does mean that those with liver problems must take a careful approach to using the medication. For those with moderate to severe hepatic impairment, no Flexeril dosage is considered safe. For those with mild hepatic impairment, cyclobenzaprine 5mg tablets can be used as an initial dose with the doctor opting to titrate slowly upward. Extreme caution is needed because there is no established safe cyclobenzaprine max dose for those with liver impairment. If Flexeril is working well, it is likely the patient will miss a dose from time to time because they will not be experiencing pain to remind them. If this happens, the patient should check to see how soon they are scheduled to take their next dose. If it is within four hours, the patient should just wait until it is time to take the next pill. If not, it is generally safe to take the missed Flexeril dose. However, patients should never double up pills to make up for missing a pill, and this can lead to dangerous side effects and even overdose. The cyclobenzaprine drug class is called muscle relaxants. Drugs in this class are often used recreationally to achieve certain mental and physical effects. The recreational dose of Flexeril depends on how much cyclobenzaprine to get high is needed for the user. Newer users have less tolerance and require less medication while those who are long-term abusers need more to achieve the same effect. In general, cyclobenzaprine alone does not produce a high great enough for recreational users to take it alone; instead, they potentiate opiates with it. In this case, 20 mg of Flexeril is a common dose, though some users may increase this dosage to 40 mg. Because it does not offer a strong high on its own, the Flexeril street value is fairly low. The LD50 of cyclobenzaprine has not been definitively established in humans. Based on studies on mice and rats, it is 425 mg/kg. As such, overdosing on any Flexeril dosage taken on its own is incredibly difficult as it would require more pills than any individual should be able to obtain. However, when combined with other drugs, the risk of overdose becomes greater. Users should be open with their doctor about any other substances they are using in conjunction with Flexeril, including alcohol, and be aware of cyclobenzaprine half life so they can schedule taking their other medications accordingly. Due to the risks associated with Flexeril use, it is important that patients only take the medication as prescribed by their doctor. Safe Flexeril dosage changes based on many variables, so users should be open and honest with their medical provider about whatever other substances they are taking. Users must be aware of the potential for addiction and seek help in recovery facilities if they begin to notice signs of dependence. Substance abuse treatment is available not only for those abusing illegal substances but the OTC-drugs like cyclobenzaprine as well. Are you or a loved one developing a dependence on Flexeril? Contact our addiction specialists at (888)-459-5511 for assistance.